Does the love quadrangle drive your three co-hosts to delight or delirium? Talia is given a chance to escape her destiny with the Psi-Corps, but is her reunion with her ex a dream or a date with destruction? 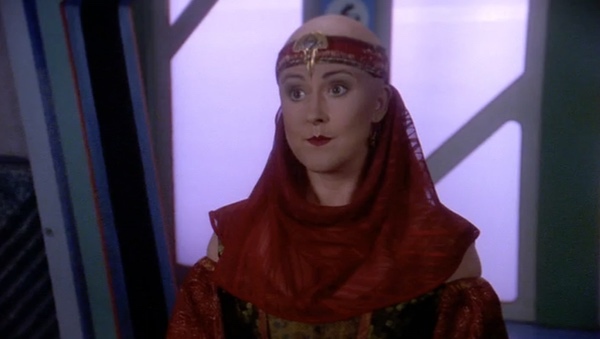 Don’t despair: The Audio Guide to Babylon 5 is taking on “Soul Mates”! Drinking and Podcasting. Very well then. I feel I should respect your tradition. I’ve poured Famous Grouse Scotch Whiskey into Trop50 smooth orange juice. Probably a bit gross, probably quite fitting. If you want to hear Jane Carr with a very different voice (and doing a Scottish accent, in fact), there’s The Prime of Miss Jean Brodie. In which she’s very good indeed, despite being under twenty at the time. No!!!!! I finally caught up! I’ve been binging on your podcast all week! I need more! Anyways, super awesome. I think you should have Steve on more often. His reactions are so interesting.